The work week ends and the weekend begins with celebratory fashion. 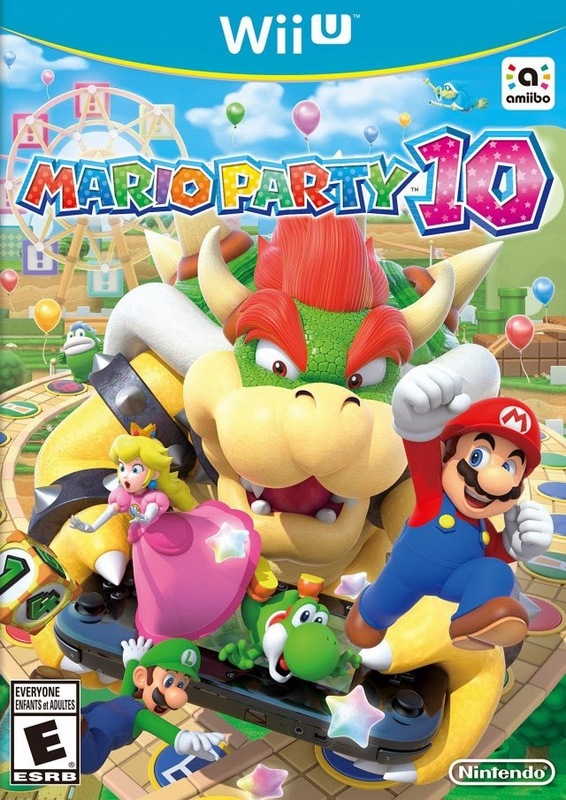 Party hard with Mario and friends in the tenth installment of the Mario Party franchise, Mario Party 10. Is this party worthy of RSVPing to? Find out with my in-depth review! that you go ahead and crash it, too. Mario Party games used to be like Maroon 5. It was everywhere, and you couldn't get away from it no matter how much you'd want to and how many times you'd smash your head against a brick wall to suffer enough brain damage to forget it forever. However, over the years and with a change of development team (Hudson to ND Cube, which to be fair is made up of former Hudson employees), Mario Party has dialed it back a bit. For instance, the Wii only had two Mario Party games released for it when the Nintendo 64 and GameCube had three and four respectively. Now, over 15 years later since his very first party, Mario is back with friends (and a ticked off Bowser) in Mario Party 10, the first entry to hit the Wii U. Does this party deliver a fiesta of fun? 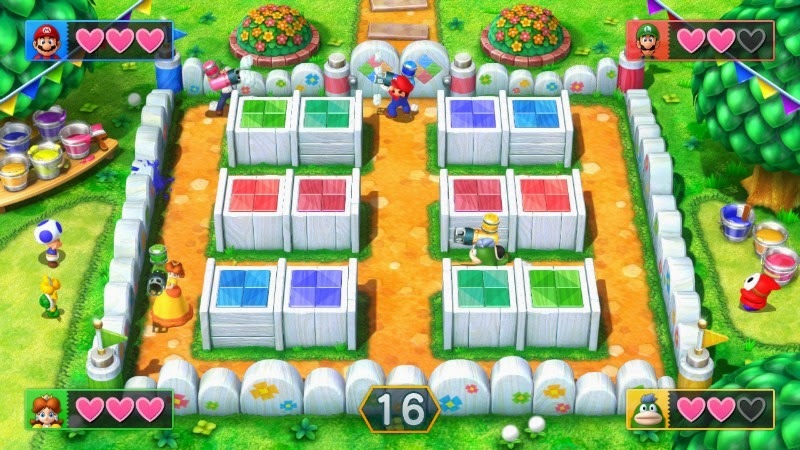 Mario Party 10's main mode, the aptly titled Mario Party, is structured similarly to Mario Party 9's. It has all four players riding along a fairly linear board, occasionally offering a duo of paths to venture down, in the same vehicle. The player whose turn it is controls the vehicle by rolling a die, and whatever spaces they land on or events they pass through happen solely to them. 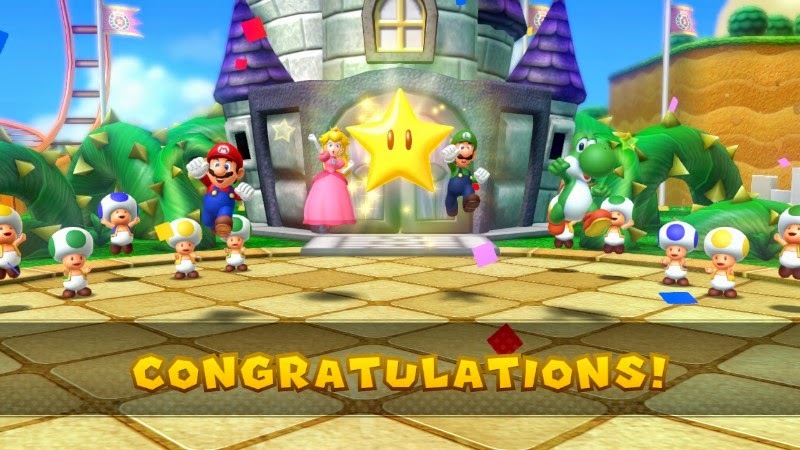 The goal of the Mario Party mode is to possess the most Mini Stars by the end of the board. This is performed through playing mini-games which happen sporadically through landing on special spaces, collecting coins from special event spaces, and a myriad of other means. Mushroom Park, the first of only five boards. Captain events from Mario Party 9 are absent, but this is seen by me as a good thing. Captain events had the player who controlled the vehicle upon reaching the event the choice of trying to influence the game with some strategy. However, these events generally took so long that they became annoying on repeated play-throughs. With Mario Party 10 removing these, play is much faster. that bundle of Mini Stars laying there. 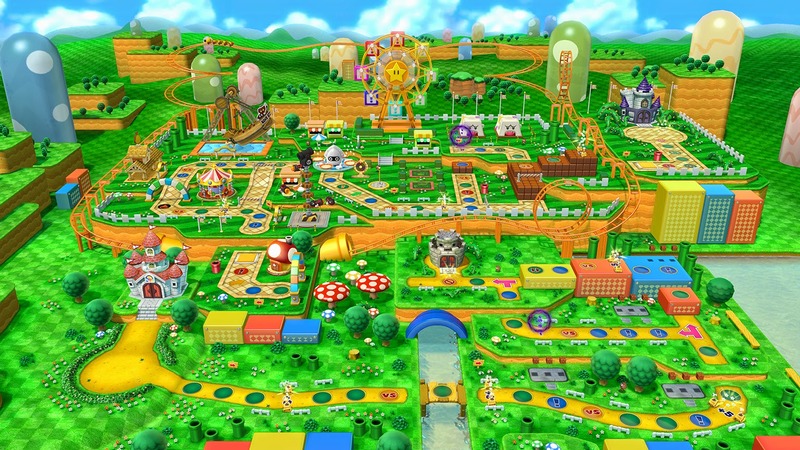 In fact, play in general in Mario Party 10 is much faster and streamlined. Gone is the waiting for a CPU player to choose a special dice block in their possession and slowly rolling it. Instead, the block is chosen without any scene showing them selecting it, and they roll. Mini-games load faster, offering simple explanations via a quick video and short, scrolling description. There's little "now what button do I press again?" in this Mario Party. 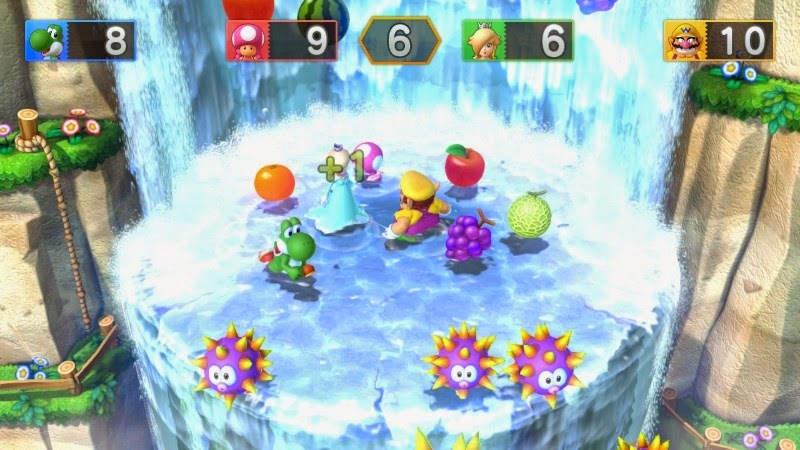 about anything for their daily dose of Vitamin C.
In the Mario Party mode, there are five boards to play on, a departure from past games that usually have six full boards at the very least. These boards feature plenty of chances for the tides to turn, allowing some players to make a daring comeback-- perhaps TOO many. It can seem sometimes that the first 75% of a board has little bearing on the outcome of a game when the last 25% has a heavy influence on who is deemed the winner and who goes home a last-second loser... and an understandably bitter one at that. When one board has it where if you end up in the path of a fireball near the end and you lose half of your Mini Stars-- which is very easy to do-- games can be decided a bit unfairly at times. What's the point of playing the first three quarters of a board, you might ask? That would be a good question, in all honesty. 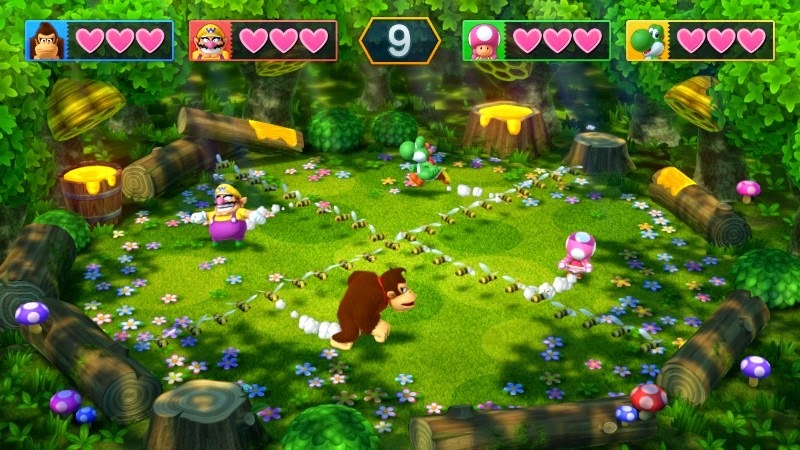 Halfway through and at the end of each Mario Party mode board is a fortress that serves as a place in a game for one of two boss mini-games. These pit four players against one boss with the goal of earning the most hits against the boss to earn the most points. There are mini-games where you try to memorize and avoid the locations of Boos to traverse a series of tiles leading to one of many spotlights to shine in King Boo's naught face, and games where you try to stumble your way through a maze to reach one of four cannons first to blast a colossal Monty Mole. Meanwhile, Bowser Party pits four players against Bowser, once again highlighting the Wii U's ability to use asymmetrical gameplay in a beneficial way. 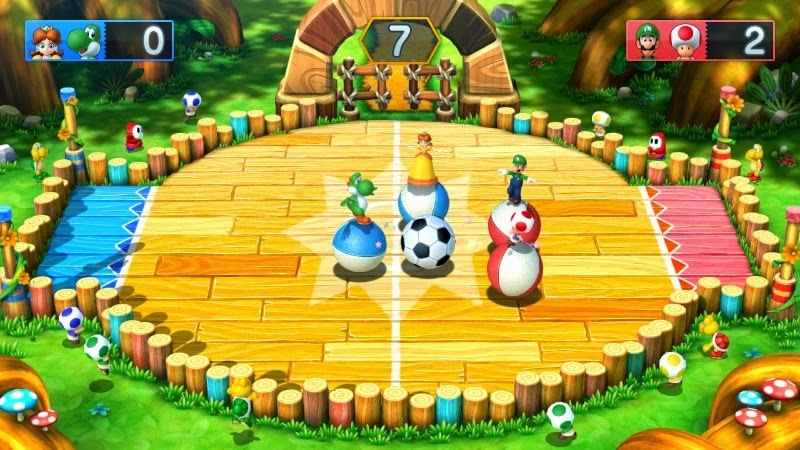 The four players use Wii Remotes while the Bowser player utilizes the Wii U GamePad for rolling die and controlling one of ten specially made mini-games for this mode. Each player on the competing side begins in the same vehicle with a set amount of hearts. Each player rolls a die, earning a special and quite helpful dice block when they land on a blue space. These can be used strategically to gain create some distance between the players and Bowser. 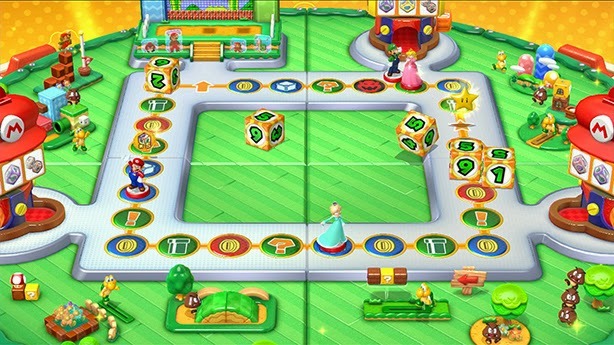 Once the players roll, Bowser gets several dice blocks to roll at once. Depending on how well or poorly the Bowser player does, the always loyal Bowser Jr. either assists his father with the addition of more dice blocks or to cause havoc for the other players. by Bowser, I think it's understandable to run away. When Bowser catches up with the other players, a mini-game begins with the goal of Bowser to defeat the other players (or at least rough them up real good) and for the other side to just survive. 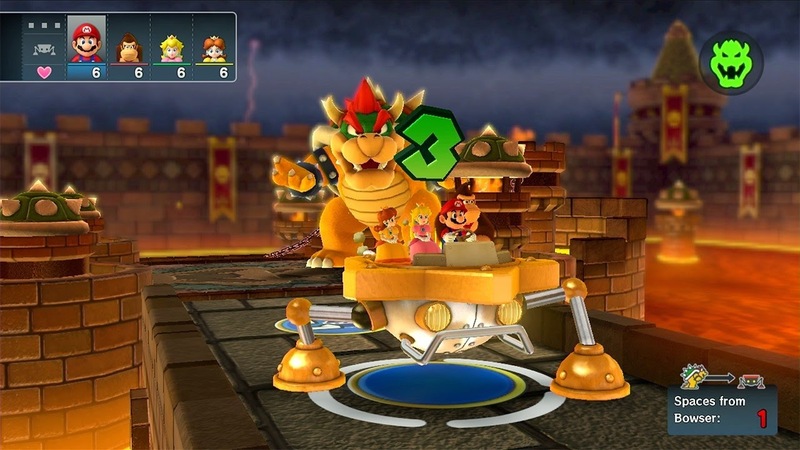 The mini-games have Bowser employing a varied amount of means to damage the other players, costing them hearts in the process. All the while the players need to evade Bowser's assaults. 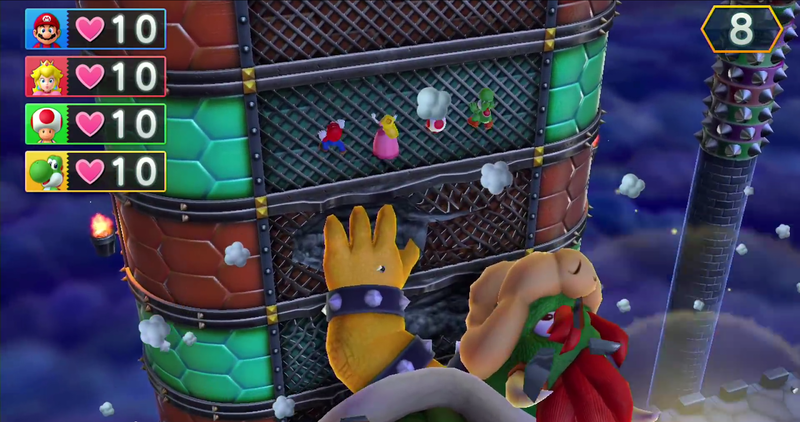 One mini-game has the players needing to quickly alternate between the A and 2 buttons to climb up a tower to avoid Bowser's advances, who pursues and shuffles up behind them. The majority of the mini-games are all about dodges Bowser's attacks with just one of them being based on luck for both sides. The mini-games seen in Bowser Party are fun to play, much like the other mini-games in general, but I can't help but wish there were at least five or ten more. With only ten mini-games total in Bowser Party, one can fly through all of them within one or two games. is going to hand it to you-- literally! The most controversial mode in Mario Party 10 is Amiibo Party, controversial due to the fact that it's hidden behind a paywall, the price of an amiibo figurine. This is closest to the traditional Mario Party rules of old. There are ten turns, and four players roll the die to move around a square board. The goal is to earn coins either through the mini-games that play after each round of turns is over or through landing on special spaces and areas to afford Power Stars. The player with the most Power Stars at the conclusion of ten turns is deemed the winner. Amiibo Party will have different properties to it. While it definitely stinks that you have to possess a $12-$13 figurine to play this mode, it sort of is offset by Mario Party 10 costing $50 MSRP instead of the full $60. Buying a figure makes it so you're basically paying the price of a full game anyway. Those mental and financial gymnastics by me aside, this isn't optimal for most people, especially those on a budget. It definitely is geared towards those who collect amiibo like myself. It's sort of underhanded by Nintendo and ND Cube to have a mode locked behind requiring a $12 toy. Mario Party 10's mini-games are one of the best batches in series history. There are a lot of things you can slight developer ND Cube for with their installments of the Mario Party series (9, 10, and the Nintendo 3DS's Island Tour), but the mini-game selection is not one of them. Games are played in a free-for-all setting, 2 vs. 2 team setting, or 1 vs. 3 setting. Thankfully, the majority of these are skill-based with maybe just one relying a little on luck. I don't want your honey-- honest! Leave me "bee"! 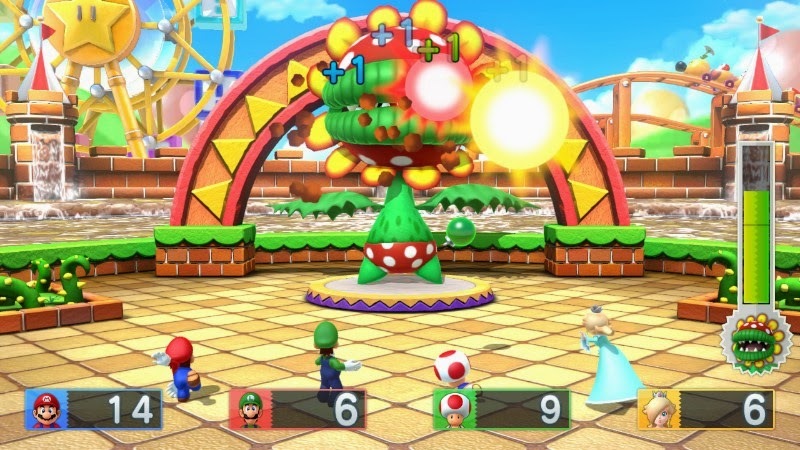 The games presented here in Mario Party 10 are generally really fun. Bob-Omb Bogey, for instance, has players trying to be the first to hit a golf ball that appears onto a tee to earn the most points. However, occasionally a Bob-Omb appears, which takes away points if it's hit by a player. Beeline Shrine features a challenge of avoiding bees that appear in various patterns. Meanwhile, Snake Block Party is a bit of platforming peril, having players scurry along in the sky on moving snake blocks, trying to reach the goal first. that they have been wanting. Outside of the three main modes, there are multiple miniature modes in the mix as well, such as Coin Challenge that pits four players to compete in a series of seven randomly selected mini-game to determine the winner by coin amount at the very end. There are also two more complicated mini-games in the form of Badminton Bash and Jewel Drop. but then you get tilt controls to worry about. 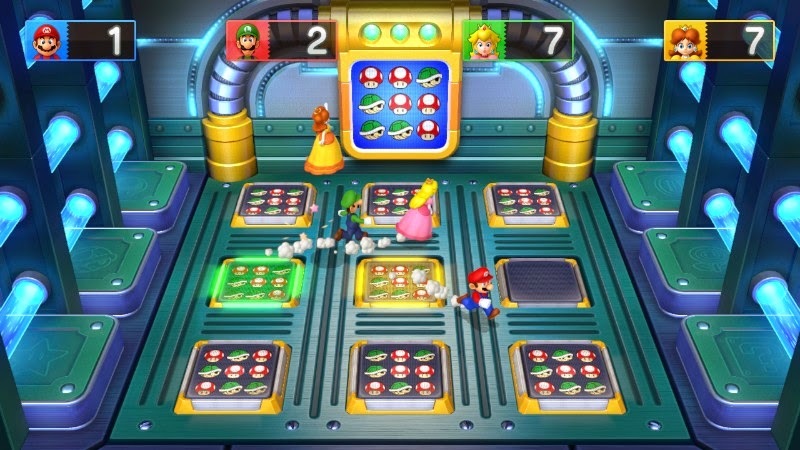 In addition to the modes presented in Mario Party 10, you can spend Mario Party Points earned from playing the game on various in-shop items in Toad's Room. From two secret characters to different vehicles for Mario Party mode, backgrounds and character models for the Photo Mode (which you can share your pics with folks on Miiverse), and music, there's a lot to spend your hard-earned points on. 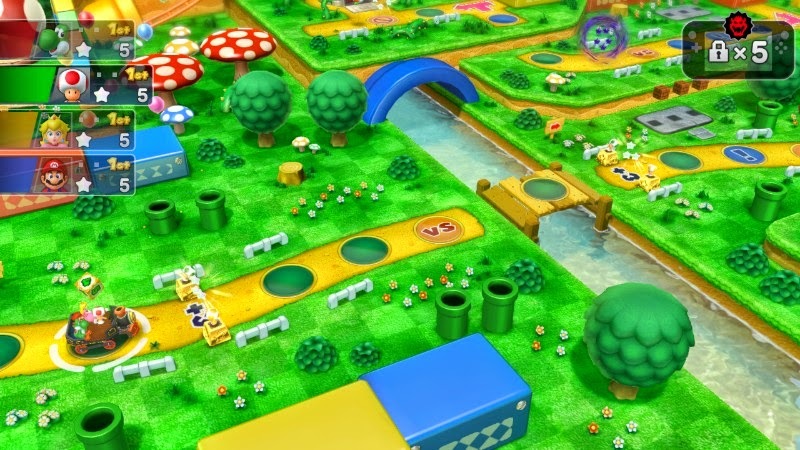 There are also challenges that unlock when specific conditions are met, earning players hundreds of Mario Party Points and adding some longevity to Mario Party 10 in the process. Ground pounds are a hazard to your butts, kiddies. Many of the modes in Mario Party 10 offer a more streamlined approach, and it seems that has bled over into the presentation of the game, too. Basic and minimalist menus are what Mario Party 10 delivers, and while they look serviceable enough, I do miss the personality that was apparent in the presentation of past Mario Party games. What is present in Mario Party 10 is much more sterile in comparison. The visuals are quite pleasant on the other hand, possessing tremendous amounts of character and polish. This is best displayed in the mini-games, which are bursting with personality. The music features competent melodic tunes with a suitably amount of cheeriness to them, though nothing that I could currently hum back to you. They just aren't that memorable this time around. Mario Party 10 might not be the great game that fans were hoping for the milestone tenth installment, but it's a fun game in small doses and solely if you have other friends to play with. A lack of online play of any kind-- even if just for mini-games, is pretty much inexcusable in 2015, once again showing Nintendo's archaic stance on online play, and hiding Amiibo Party behind a $12 paywall is sort of slimy. However, with some of the best mini-games ever seen in a Mario Party game, great boards, and a wide selection of playing choices, Mario Party 10 manages to make for a hearty party.